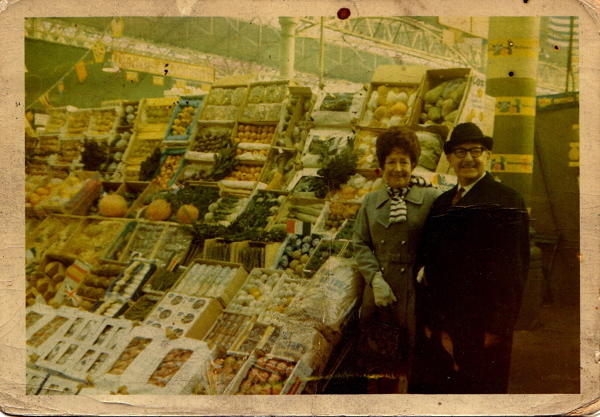 Here you see Ivor Robins’ father Maurice and mother Ethel at the Spitalfields Market around 1965, a respectable couple looking very nicely turned out in their Winter clothes, with a magnificent display of the fruit and vegetables that comprise the substance of the family business as their proud backdrop. I found this evocative photograph in Ivor’s office at the New Spitalfields Market in Leyton recently when I went over to pay him a call. 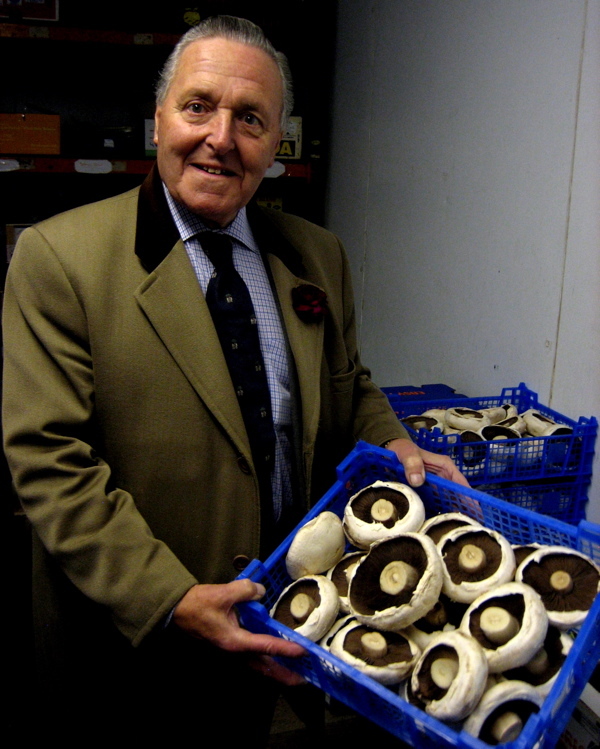 Always dapper in a velvet-collared overcoat, with a fresh carnation in his buttonhole every day for the last fifty years – of the subtle shade of red that is known as ‘clove’ – Ivor Robins is renowned in the market as the gentleman purveyor of fruit and vegetables. “Mr Carnation,” they once called him. A born sportsman who became an heroically ambitious fruit and vegetable seller, his ascendancy has been the culmination of the modest enterprise begun by his grandfather in the Spitalfields Market in 1899, reaching its zenith in 2007 when Ivor became Master of the Worshipful Company of Fruiterers in the City of London. “My father joined my grandfather Michael in Spitalfields when he was just fourteen years old – even when he was still at school he helped out at weekends – but then my grandfather got cancer and my father had to take over suddenly in 1920. Around 1950, I was at school possibly going on to university, but after three or four years intensive study, I got a thing in my head that I didn’t want to continue with my studies. I preferred the life at the market because I was very sport-oriented at the time, and the beauty of this business was that it started at five in the morning and finished at twelve, which meant I could then go and play cricket and football all day to my heart’s content. I did enjoy the business. It was totally different then because fifty per cent of produce was sold under auction at the London Fruit Exchange in Brushfield St, only English produce was sent up from the farm for direct sale. You really had to know what you were doing to buy at auction, you needed a developed sense of taste and smell so that you could buy ahead, recognising when things were going to run out. I remember in 1960, all of a sudden South Africa said they didn’t want to sell their fruit under auction, they found an agent and distributed it themselves in the market. Then other countries stopped too and selling fruit at auction ceased. We were just wholesale in 1950, and for about ten years I dabbled in retail, opening up five shops in North London but I sold that up in 1962 when I opened up ‘Hotel Purveyors,’ We went from strength to strength, supplying to gentlemen’s clubs, the Carlton, Athenaeum, Oxford & Cambridge, National Liberal, a number of leading restaurants and we specialised in private dining rooms in the City for banking firms. 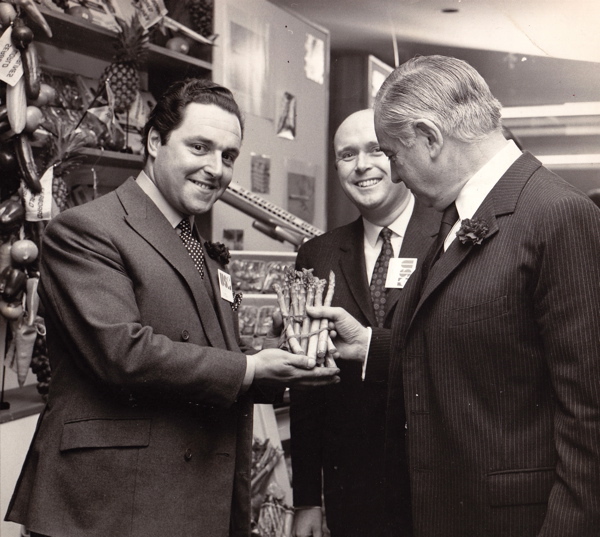 In the late sixties, there was a trend towards exotic produce and although there were half a dozen dealers in Covent Garden, there wasn’t anybody selling it in Spitalfields, so I had a lorry at Covent Garden and was the first to bring it over here and it gave us a spectacular advantage. That was how I blossomed out into the catering business, there was such a call for Aubergines, Avocados, Peppers, Lychees, Paw Paws and fresh Mint, Rosemary and Bayleaves. Today, Ivor maintains the same modest routine as a fruit and vegetable wholesaler that his grandfather and father would recognise, turning at up work at dawn five days a week, buying stock in person and supervising the paperwork in a tiny office in a corner of the warehouse. Blessed with rare courtesy and possessing a dignified respect for everyone he encounters, he remains a popular figure in the market. Ivor confessed to me the only significant disagreement he ever had with his father, which he remembers vividly to this day. As a young man, Ivor had sold some boxes of apples, when his father returned from the auction with the news that the price had gone up – since the apples had not yet left the market, Ivor suggested he tell the customer that they had increased. Ivor’s father was outraged and Ivor learnt the imperative of being a man of your word, crucial if you are to maintain a reputation for fair dealing that will last your tenure in the market. And Ivor’s tenure has been distinguished, as he confided to me, his eyes gleaming with undemonstrative pride. “Over the last twenty-five years, I have been very fortunate to meet and befriend, and be befriended by top chefs. For my installation as Master of the Worshipful Company of Fruiterers, Brian Turner, Gary Rhodes and Albert Roux cooked the dinner for me and two hundred and seventy guests at the Mansion House . Never had so many people been catered for dinner at the Mansion House before, even the Lord Mayor was impressed! It was a wonderful year, I think I did one hundred and thirty five functions. I was very privileged and very lucky that my friend John Stoddart was Lord Mayor that year, and together we attended functions with the Queen Mother, the Queen (three times), the Prince of Wales (twice) and Princess Anne (twice). It was like a fairytale, quite magical. I could not ignore the poignancy in Ivor’s story – he has exceeded the aspirations of his father and grandfather to the paradoxical degree that, after more than a century of market trading, he is proud to admit the story ends with him. In fact, Ivor Robins sold off the wholesale side of the business five years ago and now just serves his long-term catering customers. Sporting his Worshipful Company of Fruiterers’ tie with its discreet image of Adam & Eve with the apple under the tree, as a symbol of his achievement, he is a satisfied man who has fulfilled his ambitions in life and yet continues to do the work he enjoys. “Mr Carnation” is in his element. 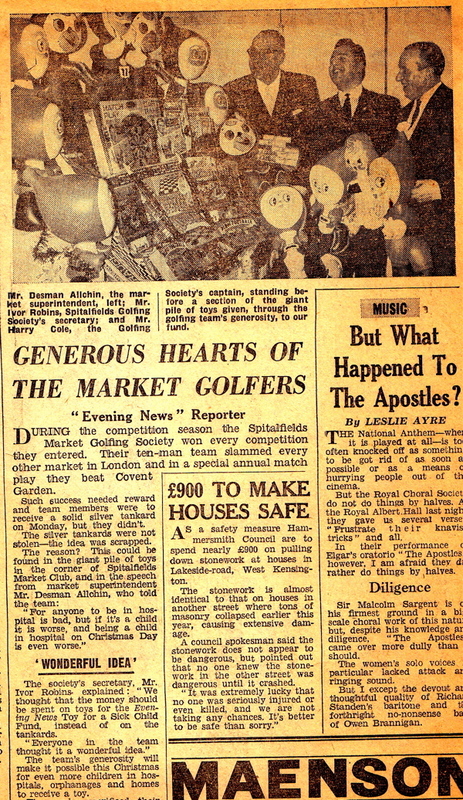 The Spitalfields Market Golfing Society with Ivor (centre) as Secretary, 1965. 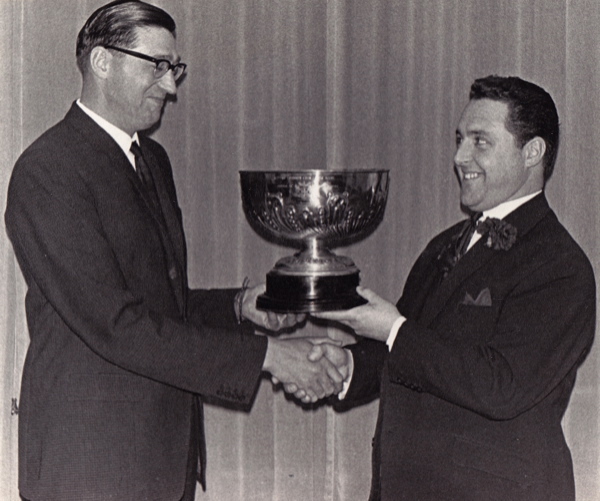 Ivor receives the cup from Desmond Auchin on behalf of the Market Golfing Society in 1965. 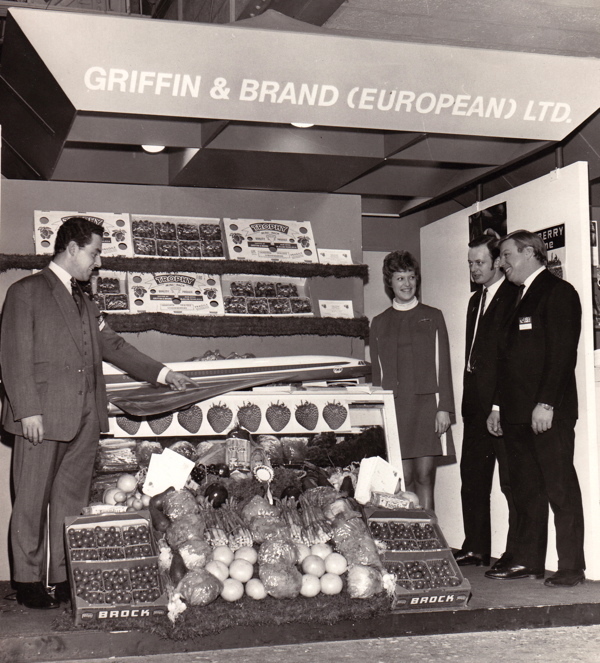 At a trade fair, Ivor proudly points out some of the very first air-freighted strawberries and asparagus that he imported from the USA in 1972. 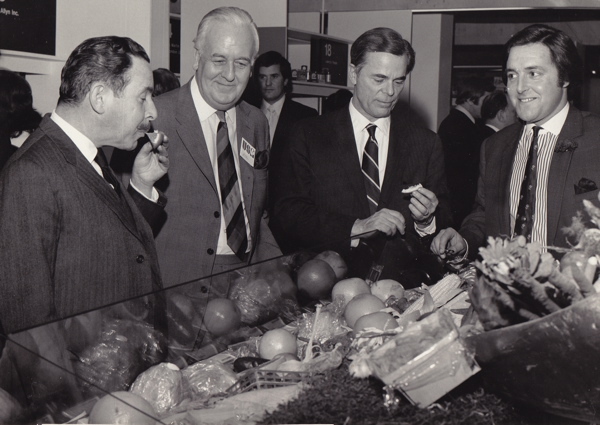 The Chilean Ambassador samples fruit from his own country imported by Ivor in 1973. 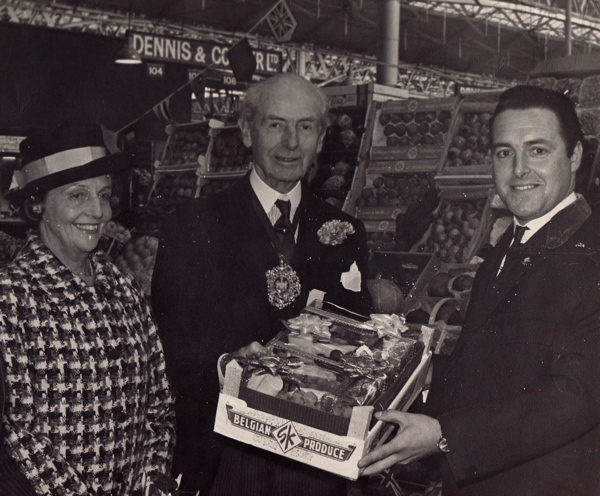 Ivor presents Belgian hothouse grapes to the Lord Mayor of London in the Spitalfields Market, 1975. Ivor Robins, purveyor of fruit and vegetables. Varnden Street. This is a man with a great work ethic and wonderfully polite. It gave me enormous pleasure to read about his life I found myself smiling many times. I remember Ivor Robins very well. I worked in Keith Prowse in Cornhill in the 1980s and he would come and buy his ticket for the Arsenal football club matches from me. I know Ivor Robins now. Might you be the Ivor Robbins shown in the log book around 1972 ? and possibly the original owner from new,any help to fill any gaps in this beautiful vehicle’s history would be welcome. What about the man who formed the Transport & General Trade Union in Spitalfields and was number one on their membership and suffered unemployment because of it.